After forming the low on December 24, 2018 low at $42.36, Oil has continued to recover. 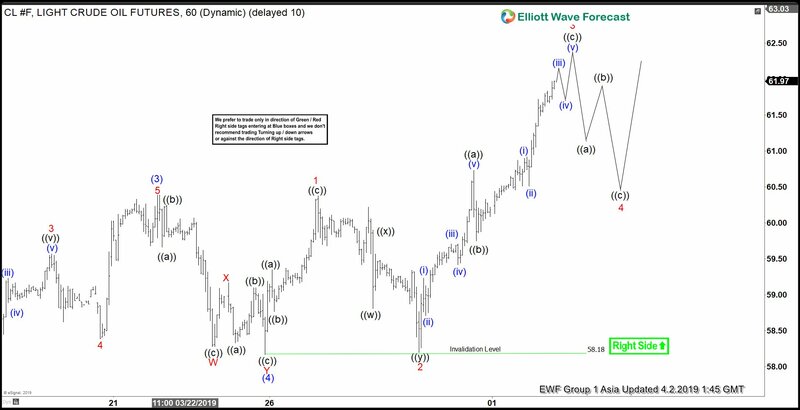 The rally from Dec 24 last year looks to be unfolding as a zigzag Elliott Wave Structure. The instrument should soon reach the minimum 100% target at $63 – $65.8 and this area can potentially end the cycle from Dec 24, 2018 low. Expect some profit taking and larger 3 waves pullback when Oil reaches this area. Expect wave 3 to end soon and wave 4 pullback to commence. While the dips stay above $58.18, oil should do 1 more leg higher in wave 5 of (5). This push higher should also end wave ((C)) of the zigzag from Dec 24, 2018 low. Afterwards, expect profit taking and larger pullback in Oil.